Kemba Walker scores 28 points as the Hornets hold off the Wizards on the road despite 40 from Bradley Beal. 2015-16 SEASON: Appeared in 80 games (41 starts) with both Memphis and the L.A. Clippers, averaging 11.7 ppg., 4.2 rpg. and 1.7 apg. in 28.2 minpg.…Played in 53 games (31 starts) with the Grizzlies, averaging 12.2 ppg., 4.5 rpg. and 1.8 apg. in 29.1 minpg….Led (or tied) Memphis in scoring eight times, in rebounding twice and in assists twice…Became the first player in Grizzlies franchise history to record 20+ points off the bench in three straight games…Traded to the L.A. Clippers in exchange for Lance Stephenson and a future protected first round draft pick on Feb. 18… Appeared in 27 games (ten starts) with the Clippers, averaging 10.9 ppg., 3.4 rpg. and 1.5 apg. in 26.3 minpg.…Led (or tied) the Clippers in scoring once…Scored in double figures 47 times and had 20+ points 11 times, including a season-high 30 points on Jan. 25 vs. Orlando…Pulled down 10+ rebounds twice, including a season-high 12 rebounds on Dec. 23 @ Washington…Had one double-double…Recorded a career-high-tying four on Mar. 23 @ Golden State…Missed one game (Mar. 20) due to a head laceration...Also played in six postseason contests (one start), averaging 10.2 ppg., 3.2 rpg. and 1.00 stlpg. in 26.4 minpg. PROFESSIONAL CAREER: Appeared in 636 career NBA regular season games (473 starts) with Seattle, Oklahoma City, Boston, Memphis and the L.A. Clippers, averaging 14.0 ppg., 4.9 rpg. and 1.7 apg. in 32.0 minpg.…Also played in 38 career playoff outings (15 starts), averaging 11.0 ppg., 4.1 rpg. and 1.3 apg. in 29.3 minpg….Named to the 2007-08 NBA All-Rookie First Team. 2014-15: Played in 78 games (70 starts) with both Boston and Memphis, averaging 15.0 ppg., 4.2 rpg. and 1.7 apg. in 31.5 minpg., while shooting a career-high .833 (239-2875) from the free throw line…Ranked 35th in the NBA in free throw percentage…Appeared and started in 33 games with the Celtics, averaging 17.6 ppg., 4.2 rpg. and 1.6 apg. in 32.9 minpg.…Traded to Memphis as part of a three-team trade with New Orleans on Jan. 12…Played in 45 games with the Grizzlies (37 starts), averaging 13.1 ppg., 4.2 rpg. and 1.8 apg. in 30.3 minpg.…Scored in double figures 65 times, 20+ points 15 times and 30+ points twice, including a season-high 35 points on Nov. 3 @ Dallas…Converted game-winning three-point play with 4.5 seconds left on Feb. 2 @ Phoenix…Recorded one double-double…Tied a career-high with four steals on Dec. 7 vs. Washington…Also appeared in 11 playoff outings (two starts), averaging 8.8 ppg., 4.7 rpg. and 1.7 apg. in 27.1 minpg. 2013-14: Appeared and started in all 82 games with Boston, averaging a career-high 16.9 ppg., 4.6 rpg. and 1.7 apg. in 34.2 minpg.…Led (or tied) the team in scoring 26 times and in rebounding five times…Scored 20+ points 22 times and 30+ points four times, including a season-high 39 points on Jan. 22 vs. Washington…Hit game-winning three-pointer on Nov. 9 vs. Miami…Recorded two double-doubles. 2012-13: Played in 81 games (17 starts) with Boston, averaging 12.8 ppg., 3.9 rpg. and 1.6 apg. in 27.8 minpg., while shooting a career-high .467 (376-806) from the floor, .385 (70-182) from three-point range and .808 (214-265) from the free throw line…Scored in double figures 51 times, 20+ points ten times and 30+ points three times, including a career-high 43 points on Mar. 18 vs. Miami…Scored the game-winning layup on Mar. 6 vs. Indiana…Also appeared and started in six playoff games, averaging a team-high 20.3 ppg., 5.3 rpg. and 2.3 apg. in 43.0 minpg. 2011-12: Missed the entire season due to a heart condition. 2010-11: Played in 75 games (51 starts) with both Oklahoma City and Boston, averaging 13.3 ppg., 4.8 rpg. and 1.4 apg. in 32.4 minpg., while shooting .811 (198-244) from the free throw line…Appeared and started in 49 games with the Thunder, averaging 15.2 ppg., 5.6 rpg. 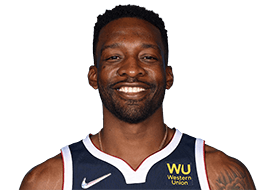 and 1.8 apg.…Traded to Boston along with Nenad Krstic, a first round draft pick and cash in exchange for Kendrick Perkins and Nate Robinson on Feb. 24…Played in 26 games with the Celtics (two starts), averaging 9.8 ppg. and 3.3 rpg. in 23.5 minpg.…Scored 37 points during a triple overtime win on Dec. 1 @ New Jersey, making free throws with 4.6 second left in the second overtime to help force the third overtime period…Pulled down a career-high-tying 15 rebounds on Apr. 11 @ Washington…Also appeared in nine postseason contests, averaging 7.3 ppg. and 2.7 rpg. in 19.2 minpg. 2009-10: Appeared and started in all 82 games with Oklahoma City, averaging 15.1 ppg., 6.0 rpg. and 1.6 apg. in 37.1 minpg….Also played and started in six playoff outings, averaging 11.8 ppg., 4.7rpg. and 1.7 apg. in 37.3 minpg. 2008-09: Played and started in 78 games with Oklahoma City, averaging 16.5 ppg., 6.7 rpg. and 2.0 apg. in 36.8 minpg., while shooting .389 (96-247) from three-point range…Scored in 20+ points 25 times and 30+ points once…Recorded 11 double-doubles. 2007-08: Appeared in 80 games (52 starts) with Seattle during his rookie campaign, averaging 10.5 ppg., 4.7 rpg. and 1.5 apg. in 28.2 minpg….Named to the NBA All-Rookie First Team…Scored 20+ points five times, including a season-high 35 points on Apr. 6 vs. Denver…Participated in the T-Mobile Rookie Challenge as part of NBA All-Star Weekend, tallying nine points and five rebounds. CAREER TRANSACTIONS: Selected by Boston in the first round (seventh overall) of the 2007 NBA Draft…Draft rights traded from Boston along with Wally Szczerbiak, Delonte West and a 2008 second round draft pick to Seattle in exchange for Ray Allen and the draft rights to Glen Davis (Jun. 28, 2007)...Traded from Oklahoma City along with Nenad Krstic to Boston in exchange for Kendrick Perkins and Nate Robinson (Feb. 24, 2011)…As part of a three-team trade, traded from Boston to Memphis in exchange for Tayshaun Prince and a future first round draft pick; Memphis also traded Quincy Pondexter and a 2015 second round draft pick to New Orleans; New Orleans traded Austin Rivers to Boston and traded Russ Smith to Memphis (Jan. 12, 2015)…Traded from Memphis to the L.A. Clippers in exchange for Lance Stephenson and a future protected first round draft pick (Feb. 18, 2016)…Signed as a free agent by Orlando (Jul. 7, 2016). COLLEGE CAPSULE: Played and started in 102 games during three seasons at Georgetown University, averaging 13.1 ppg., 6.5 rpg. and 3.1 apg. in 33.2 minpg….As a junior (2006-07), played in 37 games, averaging 14.3 ppg., 6.4 rpg. and 3.2 apg. in 33.3 minpg.…Led the Hoyas in scoring, while ranking second in rebounding and assists…Named to the Associated Press All-America Third Team…Also named the Big East Player of the Year and Big East Tournament MVP…During the NCAA Tournament, earned Most Outstanding Player of the East Regional…As a sophomore (2005-06), appeared in 33 games, averaging 11.9 ppg., 6.5 rpg. and 3.3 apg. in 32.5 minpg….Led the Hoyas in scoring and assists, while ranking second in rebounding…Earned Second Team All-Big East honors…Led Georgetown to its first NCAA Final Four since 1985…During his freshman season (2004-05), played in 32 games, averaging 13.1 ppg., 6.6 rpg. and 2.9 apg. in 33.8 minpg….Garnered Big East Co-Rookie of the Year and Basketball Times National Freshman of the Year honors…Led the Hoyas in rebounding…Named Big East Rookie of the Week five times. ONE-ON-ONE: Full name is Jeffrey Lynn Green…Lists Georgetown’s John Thompson III as his most influential coach…While at Georgetown, his mother, Felicia, attended every home game during his career…The Georgetown student section welcomed her to the arena with a “Jeff Green’s mom” chant, as she would wave back to them…You can follow him on Twitter: @unclejeffgreen.